It's a bit of a late post from me tonight, I went out for a lovely meal with my boyfriend. His parents looked after our son and it was lovely to have a bit of time off. 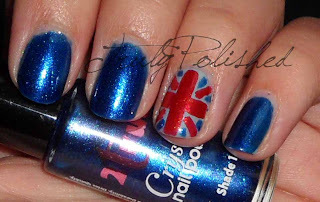 If you're from the UK you'll know today is the first day of a four day weekend, and if you're not British, you might have heard something about the Jubilee, or you might not! Today is the first day of the celebration of the Queen being on the throne for 60 years! We get a four day weekend this weekend, so everybody is in the party mood. I'm not really a Royalist, but I'm all for celebrating, so I thought I'd plan a subtle nod to the Queen. I'm not great at nail art, so I couldn't do anything too elaborate. 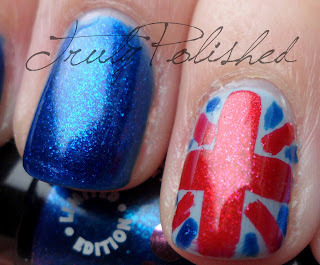 I settled on a Union Jack accent nail! 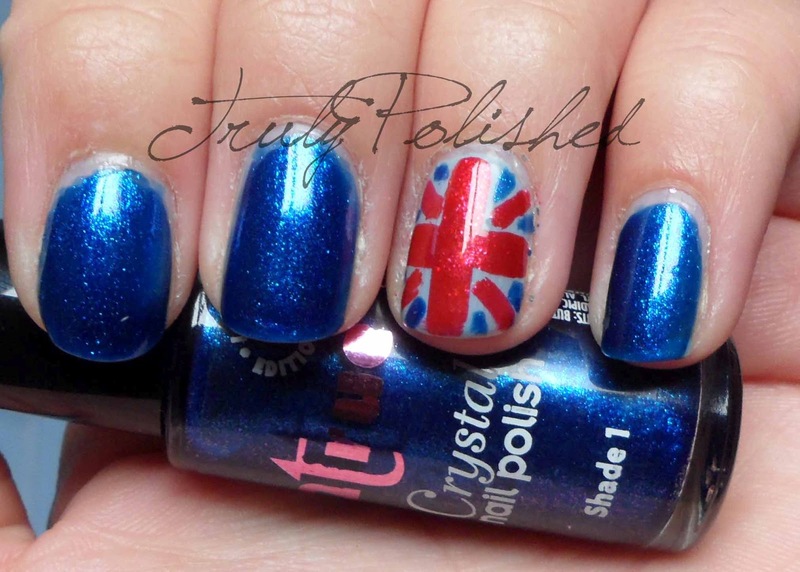 The polishes I used for this were: China Glaze Sea Spray (it's the closest thing to white I have with me!) and 2true shades 1 and 2 for the blue and red. I painted on one coat of Sea Spray, then did the red cross and diagonal lines, then put a little bit of blue in the corners. I'll have full reviews of the 2true shades probably next week. They're both highly pigmented shimmer polishes that have a glass fleck effect. They're so pretty and cover perfectly in two coats. I was so pleased with how this turned out, despite my lack of nail art skills! Hope you like it too! Thanks, I was so pleased with how it turned out! I guess my nail art skills are improving!